A newspaper in Munich reports “alarming” results from a study: 9 out of 10 Munich natives feel resentment towards Muslims, according to the Abendzeitung. So what happened is that they asked people about their attitudes towards a certain and very specific ideology, and then made the people look like racists, by using the terms “Muslims” instead of “Islam”. The “illness” they assign to the participants — to the whole of society — is “group-specific hatred of people”. This term is a new creation right out of the sociology seminar, and is intended to be an umbrella term for racism, right-extremism, discrimination and Social Darwinism. It is worth mentioning that the authors of the “study” note that there appears to be a correlation between critical attitudes towards Islam, which they try to denounce as racism, and “a strong identification with Germany”, especially among males. Unsurprisingly, the study concludes that more measures against “right extremism, racism and discrimination” are needed. “There are too many Muslims in Germany”: many of the Munich natives in a representative study agreed with this statement. A study by the Ludwig Maximilians Universität about group-specific hatred for people reveals shocking results. Only every tenth does not have a bother with Islam. Group-specific animosity towards people is still a common phenomenon in Munich. A study by the Ludwig Maximilians Universität (LMU) produced clear numbers here, especially as to the deprecation of people of the Muslim faith, long-term unemployed people, refugees, and Sinti and Roma. Almost half of the 18+ German-speaking representative natives of Munich have a medium (31 percent) or even strong hostility (18 percent) towards Muslims. 38 percent, according to the study, have a “slight group-specific animosity towards people” regarding Muslims. This means that only 12 percent of the participants do not have any reservations whatsoever about people of this faith — barely every tenth person. The LMU-scientists proposed three assertions for their survey: “Islamic culture fits well into Germany”, “I feel uneasy about the customs and traditions of Islam” or “There are too many Muslims in Germany”. The participants were asked to reply in grades of agreement or rejection. There was also a negative attitude towards the unemployed: More than 30 percent said they deprecated them (28 percent medium, 3 percent strongly ). Anti-gypsy feelings scored more than 30 percent, anti-Semitism 18 percent, and the deprecation of refugees 28 percent. But a hostile attitude towards foreigners, and classical racism, barely found any approval. Hatred towards strangers, minorities, and people who choose to live differently, found its way into the middle of society, the researchers conclude. There should be measures against that, aimed at the broader public. * Translator’s note: the German term “Gruppenbezogene Menschenfeindlichkeit” is a sociological creation, attempting to be an umbrella term for racism, right extremism, discrimination and Social Darwinism. This entry was posted in Civil Liberties, Counterjihad, Culture Wars, Europe, Media, News, PC/MC, Religion by Baron Bodissey. Bookmark the permalink. So, now in Germany people have no right to doubt that Islamic culture fits well into Germany or feel uneasy about customs and traditions of Islam? If this is the much-lauded democracy and freedom, what is totalitarianism? Despite having German ancestors my knowledge of current German culture and politics is minimal. What I do see is disappointing, and I can’t understand why Germans haven’t marched against Merkel and her fellow sociopaths. Its not too late to stop the islamification of Germany, but without courage and determination, what are the odds it won’t be overrun by parasitic muslims? Its past time Germany finds someone besides ex communist female dimwits to lead their nation. Dr. Cameron has the diagnosis. Though with dangerous views about races. Is “a sea of white Christian faces”. To be “vibrant”, and “strong”, and “inclusive”. For he must not be seen as “abusive”. They’re too many white Christian faces. Cameron will be remembered as a traitor and a hypocrite. In the third question, they couldn’t have (correctly) used any other term, since the people they’re referring to are indeed muslims (not islamists, which is something else). 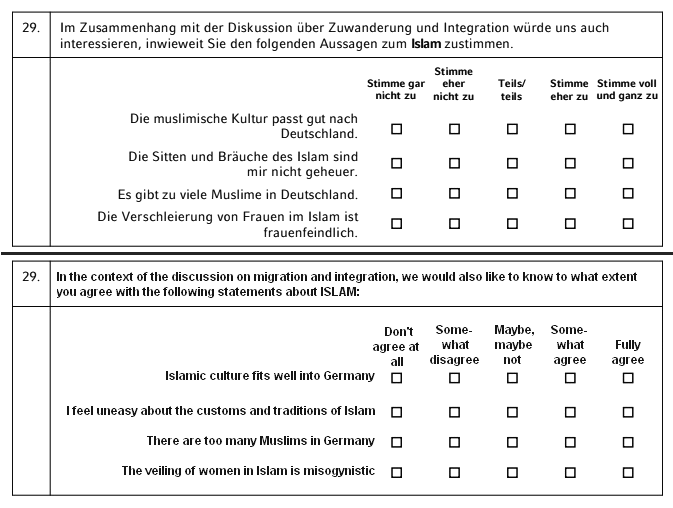 In the first question, I’m not sure why they wrote ‘muslimische’ (instead of ‘islamische’ ) Kultur in the German version but ‘islamic’ in the English version, but does that distinction matter here, for the purposes of this questionnaire? In other words, when people answered they were not making distinctions between the two terms, I think. They knew their opinions and knew what they were saying about Islam and muslims in Germany, so the findings gleaned from the poll are unaffected. Moving to the newspaper article, what is “shocking” and what we as a society, either in a pan-European or individual-country sense, do need to fully wake up to and fight back against is the extremely dangerous attempts of the Left to re-engineer, remake human nature. These are dangerous because such attempts at re-engineering have inevitably, as history shows us, ended in (deep vales of) tears. Of course we make value judgments, positive or negative, to varying extents, about various other groups! This is entirely normal. “Hatred towards strangers, minorities, and people who choose to live differently, [has] found its way into the middle of society”, claim the researchers. It is, however, the researchers who are using the word “hatred” to describe feelings which are both normal and necessary. Cultures and societies -groups of all kinds, indeed- protect and maintain themselves through their awareness that not everybody, not everything, is equally “good” and desirable. This hatred (sic) has not “found its way” into the middle of society: it has always, and always will, because-as I already noted-it’s normal and necessary. As human beings we judge, evaluate, discriminate, and so we should and must. It is, then, according to these researchers, society which is wrong and must be changed! (Do they envisage “re-education” camps?) How very wrong-footed they are, and how very, very dangerous. Being “non judgemental” has played a large role in bringing Europe to the sad situation we’re already in, and if not fought back against and stopped, will further facilitate our eventual self-destruction. I think you are correct, it should have been “the term” (singular). I have a few theories as to why they wrote “muslimische” (a fancy new adjective, only recently introduced into the German language), and not “islamische” (wich used to be the normal adjective), but they are just theories. Whatever the reason may be, currently, it can be observed that words are replaced with fancy new creations. For example, “Flüchtling” has now become “Geflüchteter”. “Moslem” has become “Muslim”, and “islamisch” has become “muslimisch”. Sorry, my first word should of course be “this”. Any chance of an “Edit” facility for comments? I changed it for you. No, our comments don’t offer an ‘edit’ choice as, say, Disqus does. Of all of them, Disqus is my favorite. One problem I have with Disqus is that it connects my login across all sites it is attached to. Sometimes I may not wish it to be known that one thing I commented here and another thing I commented there come from the same person. It builds a tracable profile. You can avoid that by using an anonymous browser and different logins. Then you must never become lazy, one slip and you’re done. Furthermore, all they need to do is block TOR exit nodes and/or trash-mail.com or similar addresses. It currently works with Disqus, but I’ve experienced shut-offs of companies that suddenly felt the need or were made to comply with… whatever. I prefer service providers where the paradigma of privacy is implemented in technology rather than policy. You become observant of this after a while, and after various experiences. They have forgotten the lessons learned from Hitler. Shame on them. The irony is that they are ignoring the lessons learned from Hitler to prevent another Hitler (far right nationalism), and in the process enabling yet another Hitler (islam). @John N I really hope you educate yourself well . This might have not been your reply if you had studied history . Shame. Sorry again. I did check before I posted, but not carefully enough. I wrote: This hatred (sic) has not “found its way” into the middle of society: it has always, and always will, because-as I already noted-it’s normal and necessary. I should (could) have written: This hatred (sic) has not “found its way” into the middle of society: it has always been there and always will be, because-as I already noted-it’s normal and necessary. HATE? If one uses this term to describe an aversion to things [germs..diseases] or organizations and even people who are inimical to one’s well being then the term is an accurate description. We took the term “Gay” meaning happy and distorted it. We now take the term “Hate” and also use it improperly. Who on earth except the weak-minded among us would “Love” Islam? The suffering masses in Islamic countries certainly do not. God bless the clear thinking people in Munich. I wonder why german people haven’t asked the reason behind doing this poll. Why would you do such a poll when the answer is so obvious? Or it should be…the simple fact that people have answered is not ok. I mean, if the poll’s question would be: do you agree to cohabit with a bunch of retarded, rabbit breeding, violent and horse sighted people, someone would say: why do you ask me something like this? Do I look like a suicidal type? Is it candid camera? Of course, they can ask whatever they want. But imagine this: do you agree to give free pass to people from countries with poor sanitation and known with ebola, hiv, blablabla? I would include the term: countries with a low level of education. Low level could be, of course, none.